The torrential rains that lashed the country for three consecutive days from July 11 were a boon for farmers as the downpours allowed them to speed up paddy transplantation, the Agriculture Ministry said. Transplantation normally lasts until mid-August in the Tarai, the country’s grain basket, when there is a normal monsoon. But if the rains fluctuate, paddy is planted till September. At this time, many farmers sow the seeds directly instead of transplanting saplings. The Tarai, which is the major paddy producing region in the country, contains 71 percent of its rice fields. The hilly region contains 25 percent and the mountain region 4 percent. This year, the monsoon entered Nepal on June 8, two days before the normal onset date. According to the ministry, the transplantation rate is higher in the far western region with 89.36 percent of the total 176,560 hectares planted to paddy. 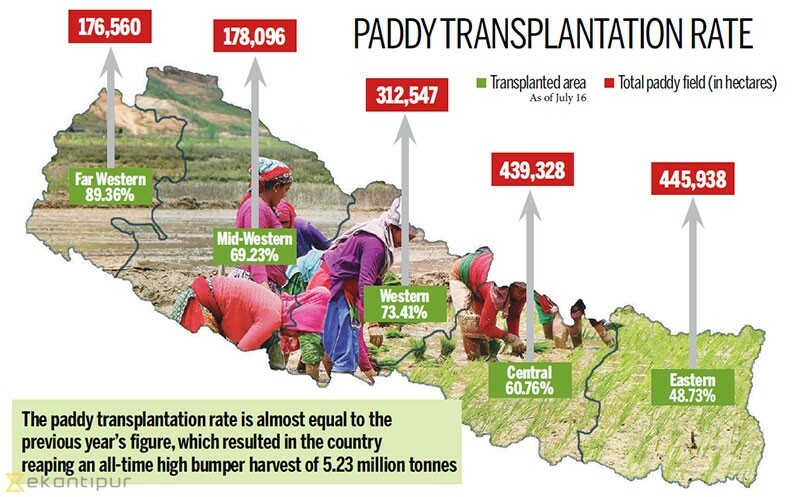 Likewise, the transplantation rate in the mid-western and western regions has been recorded at 69.23 percent of the 178,096 hectares and 73.41 percent of the 312,547 hectares respectively. The central and eastern regions, however, have seen a low transplantation rate. According to the ministry, the transplantation rate in the central and eastern regions has been recorded at 60.76 percent of the 439,328 hectares and 48.73 percent of 445,938 hectares. Saptari in the Eastern Tarai and Dhanusha in the Central Tarai have seen slowed transplantation. The transplantation rate in Saptari and Dhanusha districts has been recorded at only 28 percent of 54,000 hectares and 35 percent of 29,300 hectares. The ministry’s statistics show that paddy transplantation in the mountain region has been completed on 63.95 percent of the 58,158 hectares while in the hilly region the rate is 66.99 percent of the 399,675 hectares. In the Tarai, paddy transplantation has been completed on 63.02 percent of the 1.09 million hectares of paddy fields.